Zenawi fought his way to power and when you come from one country that has such leaders you understand the twists that these leaders take and the extremes about the legacies they leave behind. From revolutionary or freedom fighter or whatever they choose to call themselves to intolerant, oppressive, unquestionable leader whose date of departure is only up to himself and God. When such a leader falls ill, it becomes a national security issue and citizens who supposedly voted him in power are not even supposed to talk about it. So after two months of rumours and speculation about his health, the government in Addis Ababa finally announced this week the death of Prime Minister Meles Zenawi. In a televised announced on Tuesday Ethiopians were informed of the passing of their leader although no much details were revealed. The details about liver cancer and having died in a Brussels hospital were from other sources reported by foreign agencies. 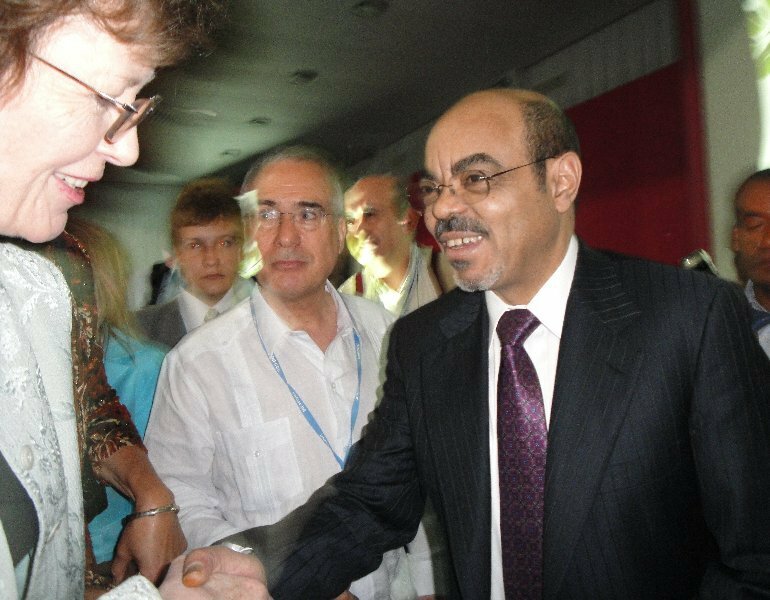 Writing in The New York Times, Dayo Olopade stressed what many on the continent found telling about Zenawi seeking medical attention abroad in secrecy. Just last month, when Ghana lost its president Atta Mills it was hailed because the leader died in his country and under the care of his countrymen as it should be. And then followed a quick flawless transition. We have limping health systems that most leaders can successfully avoid stepping into. In Uganda our president who has been in power for 26 years had his daughter flown out to Germany to deliver a baby leaving behind a health system where 16 mothers die everyday during child birth due to preventable conditions. In a CPJ Blog, Mohamed Keita highlighted the efforts that government in Addis Ababa put to keep Ethiopians in the dark about the health of Zenawi including shutting down media outlets. My Ethiopian friends wrote about the death of their leader. My friend and Ethiopian Blogger Billene Seyoum wrote a reflective status on Facebook capturing the sorrow, confusion and vulnerability that the country is facing. For the first time in my life, last night i witnessed people in the ET govt being openly vulnerable. Such vulnerability expressed in a display of emotions for their fallen comrade. “Seeing” people i never imagined i could see beyond “roles” and feeling empathy. The intensity of that moment brings to reflection that we are all united in our common humanity of complex expressed and unexpressed fear and pain. This is an invitation to reflect. As the passing of life, that we cherish or not, is always a call to stop for a minute and reflect. On our thoughts, our actions, our emotions, our intentions, our fears and hopes. To reflect on how we are all connected to the problem as we are to the solutions. To reflect on how we negotiate between two different realms of being the “other” and also “other-ing”. To reflect on how the “other” is never quite disconnected from us. To reflect on our own assumptions, expressions and contributions towards fostering stability and understanding. May peace, stability and understanding prevail over these lands and others. Peace Ethiopia-ye!!! The death of Zenawi is another moment for many in countries that live in almost one -man states to reflect. Ugandan cartoonist Fred Senoga stressed the importance of clear political transition. Lives of millions of people should never depend on a life of one man and we don’t have to wait for the deaths of our leaders to appreciate the fact that our countries need institutions not just one man! Malawi and Ghana already set a good example but that example can only work for those who have an interest in having all power centered in one person for decades. 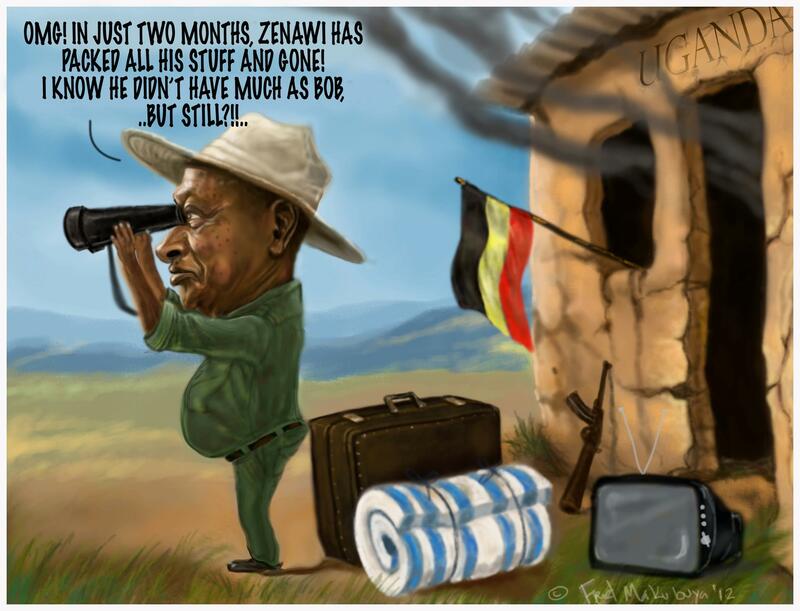 Cartoon by Fred Senoga Makubuya. We wait to see how Ethiopia will handle without a man that has dominated for more than a decade. And hopefully the country will build on the positives of his legacy. It will take real work to reverse oppressive laws and ensuring thousands in jails and those –some of my friends- who fled and all Ethiopians can finally have a better government. Africa is controlled by the globalist bankers and they will not allow any type of growth and any leader that is over there is in debt to the globalist and will do exactly what they say. So not freedom. Bet on enslavement. A very thoughtful post Rosebell. He was a complicated man. My heart goes out to Ethiopians as they go through this difficult transition. I hope is that PM Desalegne brings more openness to government and gives support to civic freedom.